Hello and welcome to Blog Talk on DML Public Radio and we are broadcasting this week from the DML Commons website. Unit 0 is an opportunity for you to get your blogs on the road, because that is the place you will be doing most of your work in DML Commons. The three of us have tons of experience working inside the engines of these machines. As a starting point, especially if you have not had any experience blogging, see out Getting Started Guide for suggestions in choosing a platform and thinking about important things like it’s name. If you are new to tooling around in a blog, we have a few suggestions to help you start Blogging Like a DML Commons Champion, using media, linking — but truly, we expect that you will develop a style that fits your interests as you get out there and publish more. During the first week of DML Commons (March 23-27) we will host our first live call-in show, via Google Hangout. We will review these topics, but really hope some of you pull your blog into the garage and we can take a look at your site and maybe give you a tune up. Our second call-in show is set for Monday, March 30 at 10 a.m. Pacific Time. This time we are looking for people who may want to bring their blog into the shop, and let the Brothers and Sisters give you some feedback, suggestions to make the blog the envy of everyone else on the street. If you would like us to give your blog a tuneup or just to admire its paint job, send us a message and your blog’s URL via our contact form. 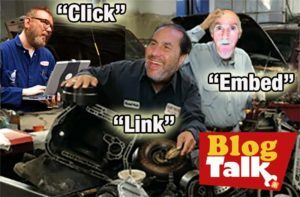 You can join us in the hangout or just watch as the Blog Brothers and Sisters put your blog up on the lift and check the engine. Volunteer your blog soon! If not, we may just run down the list of blogs added so far. Free blog tuneups, how can you pass up a bargain like that? So, that’s the plan for the Unit 0, a chance to get your blog machines running like race cars, so when DML Commons goes into full motion on April 6, you are ready to write and connect, and not worry too much about the mechanics of blogging. Want even more help? Check out our fancy Blog Talk Garage Forum. We’ll answer your questions and help you troubleshoot any issues. Oh — and one more thing — Don’t blog like my brother! Blog like my sister– she knows what she is doing.